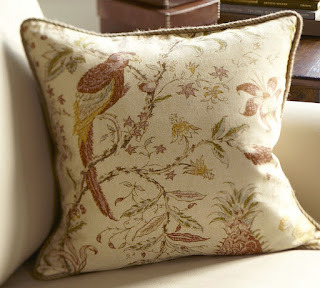 Has A Place: Family Room Updates!! So it can be done!! I updated the family room to be a more cohesive style. 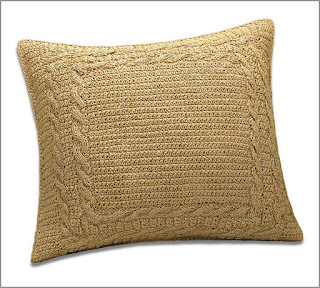 I even splurged for the pottery barn pillows. However, I did end up spending around 250 and not 200. It was a bummer. But I just cant find good pillows anywhere. I hate it. I could have went into target and got something that I "liked" but why not go for something I LOVE! So I have been on the hunt for some new pillows. I have now come to hate throw pillows. They make or break a room, I think. And if they are wrong you spent a ton of money for nothing. From my research a good large couch pillow is about $30 retail. I guess you could make them yourself, but I really don't have time to do all that. Plus once you buy the fabric its yours. Pillows, you can try and take back if you don't like them. So in comes my pottery barn pic I showed in the last post. I got two of each, my pillows from the couch should fit in them just fine. I do want to get down inserts so I will be on the lookout for those. They were all $30 each with free shipping, and most of the pillows I have found are 30 or more. So I just decided to pick some that I would love. I think these will go great on the couch. I like to use these little design websites, I think this was from my furniture site. So I can see how the room will look. It comes in handy sometimes. 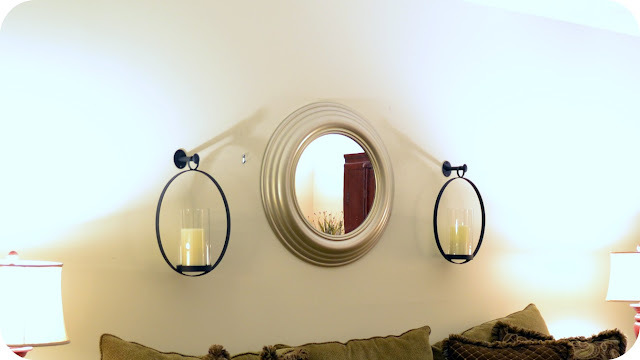 I also bought some wall sconces from overstock.com I was going for the look in the PB picture above. I'm still a little bit fuzzy over them. I want it to look inviting and cozy not tacky. Here they are. I'm also not sure about the mirror. I was telling someone yesterday that it looked like a porthole to the garage. Plus I'm not sure about the silver. It may need a paint job. So there's the update so far. Just waiting on the pillows and making up my mind. Have a great rest of the week!